By the early 1900s, New York was becoming a melting pot for immigrants hailing from different nations. Though many settlers chose Manhattan as their home, others ventured forward into the borough of Queens. America itself was named the "land of opportunity," and Greeks seeking those opportunities developed the largest Greek community outside of Athens in Astoria. Through the growth of the Greek community came Greek Orthodox schools and churches, the earliest in Queens being St. Demetrios, built in 1927, and Greek-owned businesses, especially catering halls like Crystal Palace, coffee shops (that now line busy Astoria streets), and diners. These establishments gave this special community a place to gather together and secure its standing and future in New York. 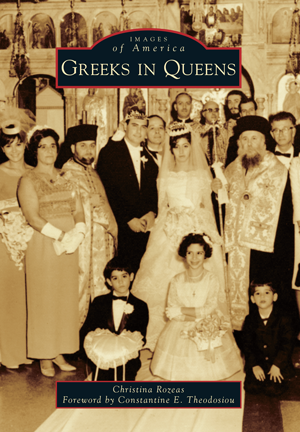 Greeks in Queens traces the immigrant journey from Greece to America and shows how the Greeks—through wars, hard work, education, and dedication—developed a thriving and much larger community than their predecessors thought possible. Christina Rozeas is a graduate of St. John's University. A first-generation Greek American, she resides in Queens with her husband.